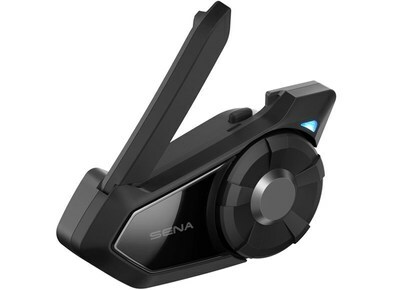 Sena Technologies, Inc., the global leader in Bluetooth innovation for the motorsports, action sports and outdoor sports lifestyles, has announced the release of the revolutionary Sena 30K Mesh Intercom Communication System. The 30K is here to simplify the way riders communicate using Sena's new Mesh Intercom Technology™, allowing for a more user-friendly setup as well as self healing and self optimizing functionality to keep riding groups connected without worrying about who's connected to who and if you're out of range. This is the future of motorcycle communication. Sena is taking things to the next level with Mesh Intercom Technology. Sena's new technology allows for riders to seamlessly stay in groups, whether using private or public mode, the Mesh Intercom intelligently self-heals, making the 30K Sena's most user friendly model to date. With one click of a button, instantly and seamlessly connect to a virtually unlimited number of 30K riders within a mile range using the public mode feature. In private mode a rider can create a group, or mesh, with up to 16 riders at a range of up to 1.2 miles, while an endless amount of guests can listen in. When riding with five or more users, the Mesh Intercom will intelligently keep the group connected at a range of up to five miles. The private mode allows an endless amount of Guest mesh users to listen in on the conversation as well. With the 30K you won't have to leave Bluetooth users behind, the 30K houses Mesh and Bluetooth processors which allow both functions to work in conjunction with each other. Each 30K allows for Bluetooth pairings with a smartphone and GPS as well as three other Bluetooth devices, while the device itself acts as bridge to bring all Bluetooth intercom users into the Mesh group. This way, 30K riders can still intercom via Mesh with Bluetooth only headsets such as the 20S EVO, 10S, or 10R. The 30K packs the same coveted features of previous Sena devices such as Audio Multitasking, the ability to take phone calls, listen to music, hear turn-by-turn GPS directions, built-in FM Radio, Advanced Noise Control™, and more. The 30K features a new quick charge feature that allows for three hours of Mesh Intercom use or five hours of Bluetooth Intercom with just 20 minutes of charge time. Also, users may conveniently manage and navigate through the 30K's many features with the 30K Utility App. The 30K will be available in both a single and a dual kit retailing for $329 single / $579 dual. For a closer look at our full product line in action, including helpful tutorials, head to Sena's YouTube channel.